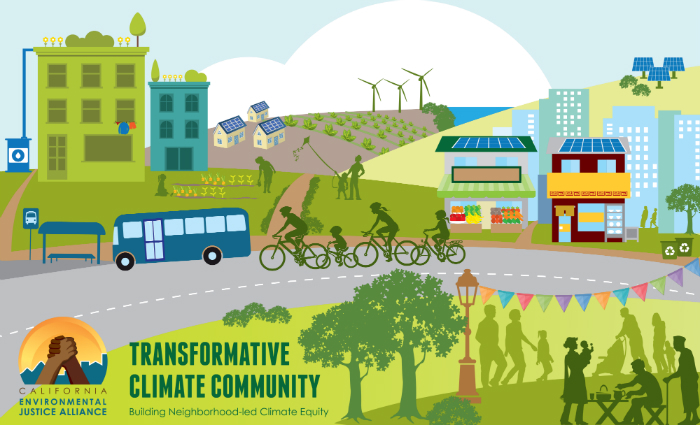 Transformative Climate Communities (TCC) is a groundbreaking new program that will develop comprehensive, cross-cutting, and transformative climate investments at a neighborhood scale to achieve multiple greenhouse gas, public health and economic benefits in our state’s most vulnerable communities. CEJA is deeply engaged in the implementation and working with our members to ensure the program truly meets community needs through a strong, transparent, and community-led process. 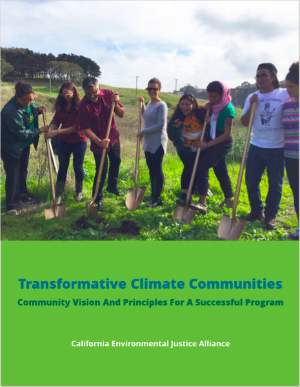 In our new report, Transformative Climate Communities: Community Vision And Principles For A Successful Program, we draw from CEJA’s members, partners, and allies to provide a snapshot of what TCC could look like in both urban and rural environmental justice neighborhoods across California. From transforming the goods movement in San Bernardino to comprehensive land use planning in Fresno, the wide range of community-led plans for place-based transformation are all grounded in an integrated, collaborative approach to reducing climate change while comprehensively addressing a legacy of environmental pollution and disinvestment in the most highly impacted communities. The TCC program can help community-based organizations in crafting sustainability plans and leverage existing ones that address long-standing environmental health and justice challenges, while catalyzing equitable economic development at the neighborhood level. The program will achieve this by awarding large grants to develop and implement neighborhood-level climate sustainability plans drawing from deep resident engagement and in partnership with other important stakeholders. In addition, we provide some of the indicators for environmental, health, socioeconomic, community and political transformation that can be achieved though comprehensive, cross-cutting climate investments from the TCC. CEJA’s work on the TCC program grows out of our Green Zones Initiative, where we recognized early on that in order for place-based models to be successful, communities need to have the power to guide development and investments. Green Zones require closely coordinated and leveraged public spending targeted to our most overburdened communities, with deep resident engagement to direct investment. The Transformative Climate Communities program is this vision come to life. Through its community-level planning and investments, the TCC program can help to achieve a just transition away from inequitable and polluting development patterns that have plagued so many communities. It can help us maintain California’s global climate leadership and move us toward a new future that weaves together environmental and climate sustainability, economic opportunities, and strengthened local democracies. Read our full Transformative Climate Communities report here.